Yo soy nueva usando este tipo de mascarillas, he usado 'packs' pero no mascarillas como tal, se han vuelto muy populares por todos los beneficios que tienen, esta es la segunda que pruebo, y realmente me encantaron los resultados en mi piel, como siempre este producto llegó muy tarde a mi casa, pero lo he usado por varias semanas para poder compartirles mi opinión. I am new in this new mask products, I only used regularly sleeping packs but not masks, this is the second product of this type that I tried and I'm really impressed with the results, unfortunately this product arrived too late to my house sorry Jolse for the late review but I've been using for a few weeks and I can share with you my opinion. Esta mascarilla revitalizante de noche ayuda a mantener la piel brillosa y ayudar para evitar las arrugas, esta mascarilla tiene ingredientes naturales como la Soya Negra que ayuda a regresar la juventud a la piel, Ginseng que ayuda a la propiedad de la piel para autorevitalizarse y mantenerla suave y por última la Orquídea que hace la piel más suave, brillante y saludable. Esta mascarilla es anti-envejecimiento con una fórmula no-pegajosa que ayuda a la piel hacerse más suave y más elástica durante la noche. Revitalize sleeping mask with brightening and anti-wrinkle function, this cream has natural ingredients like Black Soybean, that helps to return young to the skin, Ginseng improves skin's self propagation and energy and cares smooth skin and Orchid that makes skin soft, bright and healthy. 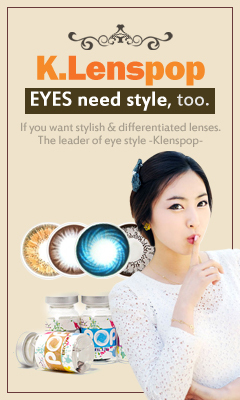 Anti-aging sleeping mask with non-sticky formula to make smoother and more resilient skin overnight. 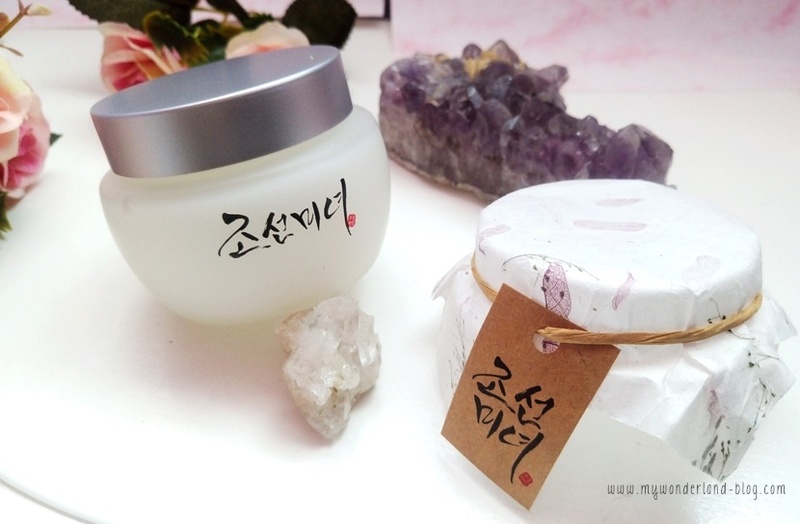 El empaque de esta mascarilla es realmente simple y hermoso, los empaques de esta marca están basadas en la porcelana blanca de la Dinastía de Joseon y el empaque con un estilo Coreano. En la caja pueden encontrar las características, e información general en Inglés y Coreano, me encanta le empaque porque es amor a primera vista, se siente lujoso aunque no es tan caro este producto. Tiene muy buena calidad tanto la caja como el frasco. The packing is really simple and beautiful based in the white porcelain of the Joseon Dinasty and a warm Korean-style package. You can see this characteristics since the box, they combine a pretty soft lila with white, for me is a really nice packaging that since the first sight you are pretty sure that is a awesome and luxurious product but in fact is not too expensive. Dentro de la caja puedes ver el hermoso frasco con una bonita capa de papel hecha a mano con el sello de la marca, me encanto este tipo de empaque porque se ve caro y lujoso sientes que tienes un producto de alta gama pero sin un precio excesivo. 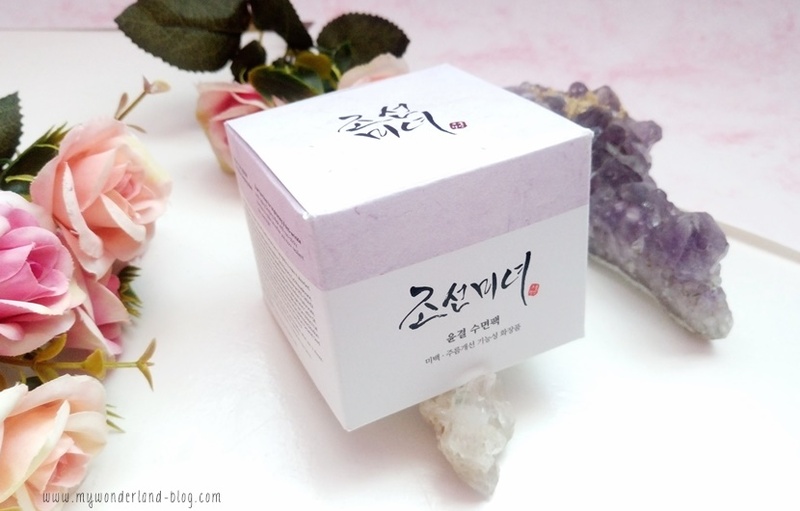 On the sides of the box you can see the ingredients, characteristics and general information in English and Korean, when you open the box you find the most beautiful jar with a pretty paper cap with the logotype of the brand. Cuando saque el frasco pensé que era de vidrio pero no, es un tipo de plástico que parece casi vidrio XD Esta mascarilla contiene un total de 80ml que es una buena cantidad para este tipo de productos. Después de lavar tu cara en la noche aplica tu toner y después aplica una buena cantidad de esta mascarilla y deja que se absorba. And here is how the jar looks, at first sight could appear like a glass jar but it isn't is made with a nice plastic that looks like glass XD This sleeping mask contains 80ml in total. After washing your face at night, tidy up skin with toner and apply a suitable amount of Revitalize sleeping mask and let it aborbed. 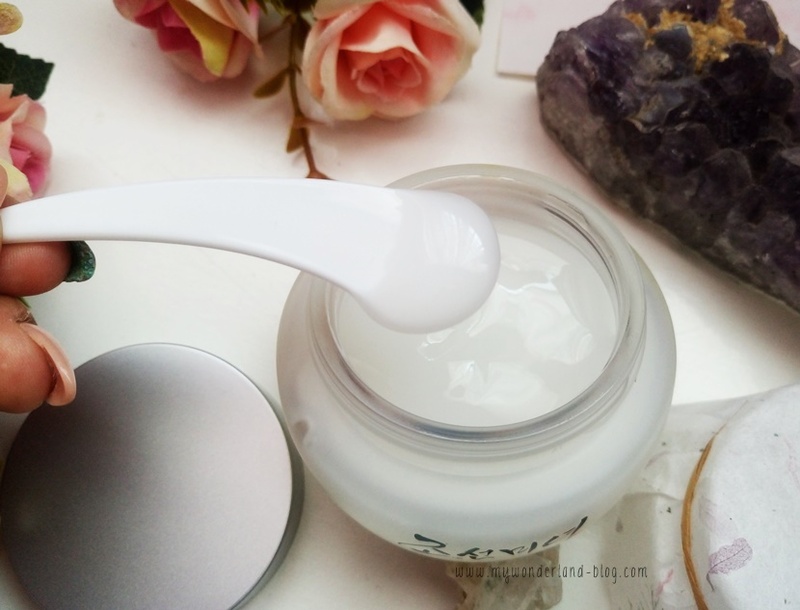 La forma de uso es muy simple, en 1 solo paso tienes tu rutina completa, la textura es lo que más me impresiono de esta mscarilla, a comparación de la mascarilla de Laneige que es como tipo gel, esta mascarilla de Beauty of Joseon es un tipo de gelatina, se ve sólida cuando abre el frasco pero cuando empiezas a moverlo se ve como es un tipo de gel-gelatina. 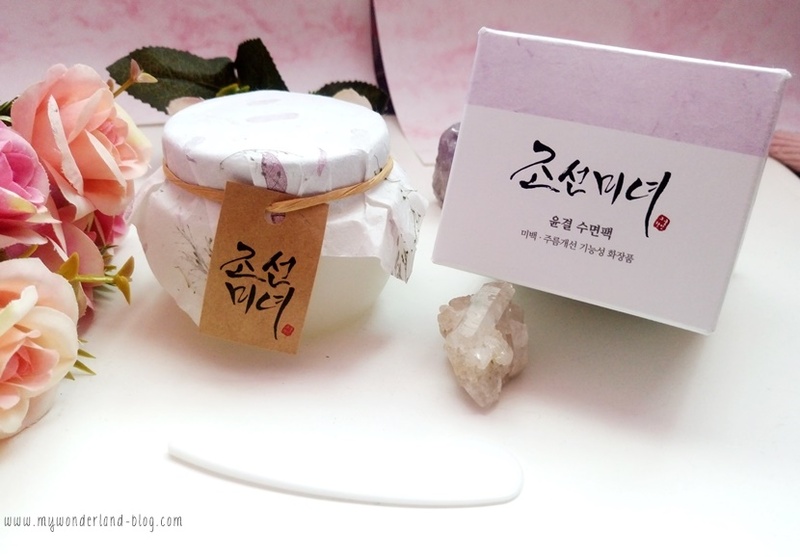 How to use is very simple, now let's continue with the texture, that was the most impressive thing of this mask, a comparison with the Laneige sleeping mask what is like a gel, Beauty of Joseon mask is like a type of gelatine, it looks solid but when you move the jar or you want to take some of product with the spoon it looks like jelly. Con esta textura me parece que si es una mascarilla, cuando lo aplicas en tu piel puedes sentir como se va derritiendo dejando una capa gruesa de producto, incluso en la foto pueden ver esta capa en mi mano, esa capa es lo que hace la magia en toda la noche. Tiene un olor muy rico como dulce con algo famaceútico, es difícil de describir pero no es molesto ni muy empalagoso. Después de 5 min aprox de aplicar el producto se empieza a absorber por completo dejando la piel brillosa y suave, puuedes ver los resultados desde la primera aplicación. 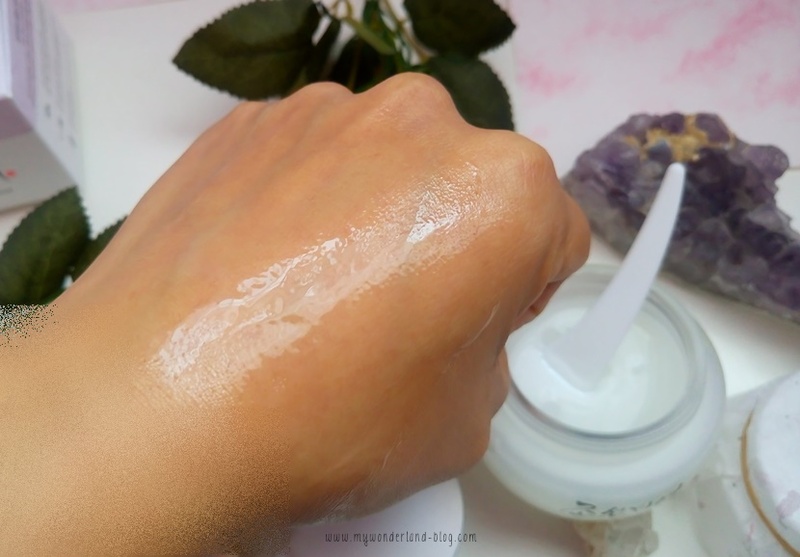 With this texture for me is more credible that it's a mask, when you spread the product in your face you can notice the thick layer in your skin, even in my hand like in the photo you can see how the products looks. This mask has an good scent like sweet but with something chemist's I like this scent because is something refresher and nothing cloying. After 5 min aprox the mask starts to absorbs in the skin leaving a nice effect of brightening and smoothing in only few minutes. Este producto deja al siguiente día mij piel suave y humectada, definitivamente la idea de dejar una capa en la piel protectora me parece increíble. La textura al principio puede sentirse extraña pero cumple perfectamente lo que promete, y lo mejor es que en mi piel grasa o seca no me deja la sensación de piel pesada o brillosa con grasa. Con esta mascarilla sientes los cambios desde el primer uso incluso puedes sentir tu piel más firme al siguiente día. Me encanta y la uso casi a diario, aunque la marca no dice nada sobre cada cuando usarla a mi me parece perfecta para cada 3er día. 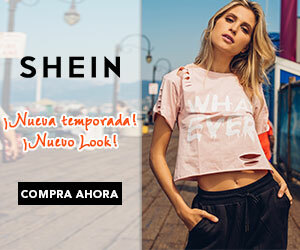 Realmente les recomiendo el producto, por el precio y la cantidad de producto se me hace una excelente opción, si son de piel muy grasa o con tendencia a acné les recomiendo hacerse una prueba antes de agregarla a su rutina diaria. Muchas gracias a Jolse por dejarme probar este producto, como siempre he sido totalmente honesta con ustedes. This products leave my skin the next day smooth and moisturized, I really like the idea of this mask leaving a barrier to protect it. The texture could be strange but it works perfectly on the skin and it doesn't feel heavy or oily after is absorbed. I noticed a lot of good changes when I use this mask, my skin looks brighter and even firm, is a little change but you can feel how this mask firms the skin, for me and my dry-combination oily skin is a great mask to use almost everyday. I really recommend you for the price and the quantity of product I think is a really nice option, thank you so much to Jolse again for let my try this product, as always my opinion is completely honest.